Feature In Good Homes Magazine! Something very, very exciting happened this week! 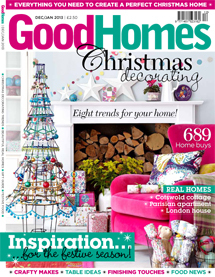 Goodnight Boutique – or more specifically our Christmas range ‘Brown Paper & String’ – was featured in Good Homes magazine! You can read the full post and remind yourself of the range here! Well, now it’s happened! And I’m absolutely thrilled! Goodnight Boutique is on page 17 of the Christmas issue of Good Homes, which is available to buy in Tesco, WH Smith, and many other major retailers. A selection of the range is already available to buy on my Etsy shop. The rest is going to be added – along with the rest of my Christmas items – over the next couple of weeks, in plenty of time for those festive purchases, and Black Friday & Cyber Monday. Absolutely brilliant news – well done! I hope you get lots of orders from it! Congratulations- that’s amazing news! And you look good in print! Yay, well done you! Congratulations! Many congratulations in getting into the mag. I hope it brings lots of business your way as your items are great.